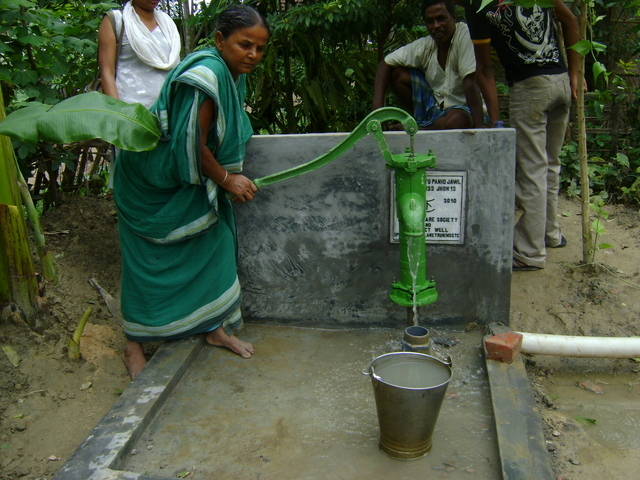 This borewell # PW133JHDN2, is in Goalbathan village of Gaighata block of North 24 Parganas district. Probin Sarkar donated the site for the community. 2 ft water. 13 families, 47 people. Sold the theoline 300 ml. Used for drinking and cooking. There is 3ft of water.500ml theoline was sold.13 families.47 people. good water used for drinking and cooking. 13 families 47 peoples , good water, drinking and cooking used. Pw132. Water in the filter. 12 families, 43 people. Used for drinking and cooking. 1 lt Theoline was sold. Goyalbathan. 21ft water 600ml thiolin give. good water 13familys 48people drink and cooking use. A day long visit to several new sites. Traveled on three motorbikes with Paramita, Dennis, Mome, Biswajit and Surajit (staff of AWS). Was nice to see the wonderful team spirit that made it possible to construct so many dugwells in such a spread out area. Construction was nearing completion on the date of visit. The construction is just completed. Some finishing work is going on like the tin cover need to be attached and the arsenic test and application of the disinfectant are due. 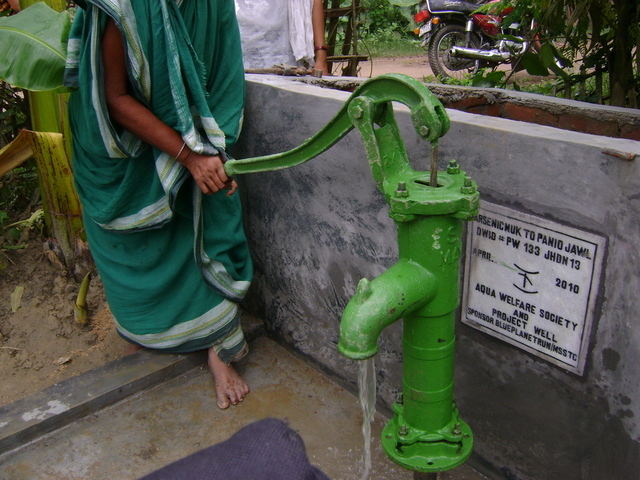 The community will be trained to apply the disinfectant and field workers will visit the bore-dugwell for two years or until the user community feels confident to take the responsibility of the bore-dugwell. According to the register record of July 2011 the total consumers=32; Families=9; Male=15, Female=17, children <5 = 2 and students =7.